Joshua Weinstein didn't have an easy time making his movie MENASHE. The filmmaker drew his cast of nonprofessional actors from members of the Hasidic Jewish community in Borough Park, Brooklyn. Many had never even seen a movie before. Some signed on and then dropped out, fearing the disapproval of their synagogues and their children's schools. Weinstein doesn't speak Yiddish, the language in which the film was made, so he had an on-set translator who read the lines to him in English. He stood far away from the actors, directing them through earpieces, in order not to attract attention in the cloistered enclave, which takes a skeptical view of modernity. Financing came sporadically, and the movie took nearly two years to complete. A cinematographer who has worked on documentary films in foreign locations, Weinstein told the L.A. Times he wanted to tell a human story in his own backyard. The film, a low-key drama about a Hasidic widower trying to regain custody of his pre-adolescent son, is a small gem. Weinstein was fortunate in finding as his star the talented Menashe Lustig, 38, a member of the Skver sect, who had created some YouTube comedy videos and was not averse to acting in the film. The movie's story is based loosely on Lustig's own experience as a widower who temporarily lost custody of his young son. The movie's Menashe is a stout, jovial but hapless man who works as a grocery store cashier for a disapproving manager who constantly chides him for failing to mop the floors. His wife, Leah, died a year ago, and his brother-in-law Eizik and his wife have taken custody of Menashe's son, Rieven (Ruben Nyborg). Jewish law, as interpreted by their rabbi, requires that the boy be raised in a two-parent home. Menashe is not only single, but he is in no hurry to remarry, regularly rejecting arranged matches. Rieven is well cared for in his uncle's home, but Menashe deeply misses his son. One day he picks him up on his way to see his tutor and gives him a special present — a newborn chick. He amuses the boy by singing him a little song about the chikele who will grow up to be chicken soup. Father and son have a sweet, easy rapport, and we feel the sad injustice of the situation. When Menashe, aching for his son, insists on taking Rieven to live with him, he oversleeps and has nothing for the kid's breakfast but cake and soda pop. While he loves his father, Rieven misses the stability of his uncle's home; at one point calls Eizik to come retrieve him. 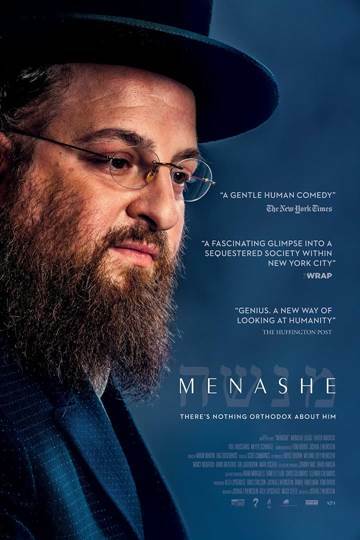 The movie is filled with the details of Menashe's daily life – putting on his tzitzit (ritual fringes), praying before bed, ritually washing his hands, joining his fellow Hasids in an evening of boisterous song, drink and laughter. Such scenes beautifully illustrate the joyousness in worship that is central to Hasidism. You may have gathered that I take particular pleasure in the Yiddish language. It was my mother's native tongue, and became in my childhood a secret code she shared only with me. Like many second-generation Jews, my parents used it mostly for things they didn't want the kids to hear. I took pains to memorize some Yiddish, but mostly the idiosyncratic curses, like my favorite, which translates to “You should grow like an onion, with your head in the ground.” Menashe brought back to me words and phrases I had not heard in many years: someone says, “Why are you knocking a teapot?” The Yiddish phrase is hak a tchynik, talking nonsense or rattling on, like a boiling teakettle. Even for those without an interest in Yiddish,MENASHE is that rarest of things: a small ethnic film that, unlike its maladroit hero, never puts a foot wrong. The acting is very naturalistic, impressive considering the performers' inexperience. Weinstein's screenplay feels authentic and lived, because of his nonfiction-film background and the script's incorporation of true stories. The story is authentic, moving, and blessedly free of easy pathos and unrealistically tidy solutions. 4 out of 4 stars.